Typically, arterial roadways in urban and suburban contexts have many things vying for a motorist’s attention in and alongside the roadway. Additionally, as a motorist’s speed increases, their cone of vision narrows. These aspects require mid-block pedestrian crossings to incorporate a number of features to alert motorists to the presence of a crosswalk and specifically drawing attention to a pedestrian who is currently crossing or waiting to cross the road. When a crosswalk transverses multiple lanes of traffic traveling in the same direction, there is the potential for a multiple-threat crash. A multiple-threat crash happens when a vehicle in one lane stops for a pedestrian in a crosswalk and obscures the view of the pedestrian from vehicles in the adjacent lane. If the vehicle in the adjacent lane fails to stop because they did not understand why the other vehicle was stopped there may not be enough time and distance for the motorist to stop by the time they see the pedestrian walk into their lane. A combination of high visibility crosswalks, refuge islands, active warning beacons, stop bars set back from the crosswalk and crosswalk signs above and on both sides of the street can help provide better viability of pedestrians in the crosswalk. Pedestrian crossing islands are proven safety countermeasures and should be provided at mid-block locations whenever possible. Pedestrian crossing islands increase visibility of the crosswalk to motorists, reduce pedestrian crossing distances and allow pedestrians to cross the road in two-phases. The crosswalks are staggered to direct the pedestrians view towards oncoming traffic. The design of the staggered crosswalk should take into consideration the equipment used to clear snow. 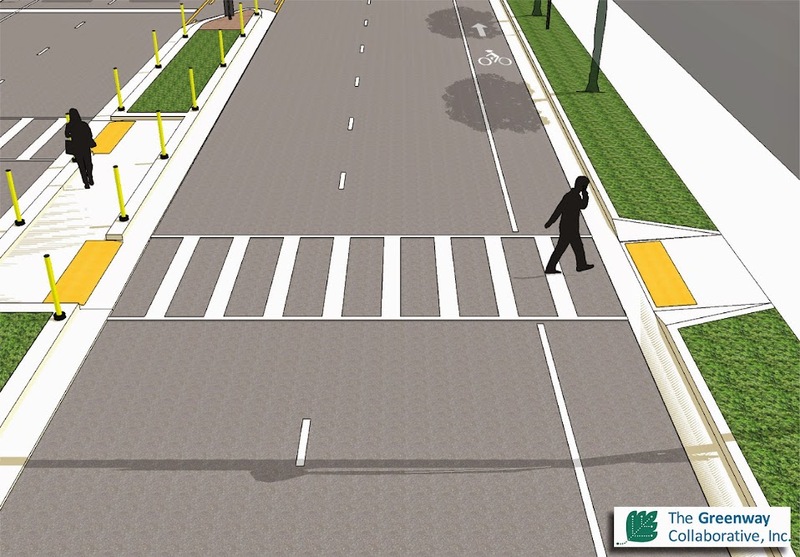 The island is extended to the position of the stop bar whenever possible to increase visibility of the crosswalk and prevent motorists from passing vehicles that have stopped for a pedestrian. Mast arms are used to place signs and beacons above the travel lanes as road-side signs may be obscured by large vehicles. These elements increase visibility of the crosswalk and alert motorists that a change in the roadway is taking place. Rectangular Rapid Flash Beacons (RRFB) should be used in conjunction with the pedestrian crossing islands to alert motorists that a pedestrian is crossing or about to cross the road. RRFB’s are positioned above the roadway on the mast arm in left lane and on the post so they are visible to motorists in both lanes. Study’s have shown that RRFB’s increase motorists yielding behavior at crosswalks significantly when supplementing standard pedestrian crossing warning signs and markings. The Overhead Pedestrian Crossing sign (R1-9 or R1-9a) should be used to remind road users of laws regarding right-of-way at an unsignalized pedestrian crosswalk. This sign is placed on the mast arm above the roadway. In Michigan, it is a yield or stop based on local law and signs should be adjusted accordingly. The In-Street Pedestrian Crossing sign (R1-6 or R1-6a) is placed at the nose of the pedestrian island to remind road users of the laws regarding right-of-way at unsignalized pedestrian crosswalks. The sign must comply with breakaway requirements of AASHTO’s guidelines. When not placed on an island, but in the roadway itself, the sign may be used seasonally to prevent damage in winter from plowing operations. A high visibility ladder style crosswalk, which includes a combination of 6″ wide transverse lines and 1′ wide longitudinal bars, improves visibility for motorists and usability for pedestrians with sight impairments. The crosswalk width should be set such that it can easily accommodate all pedestrians crossing the road (minimum of 6′ wide). 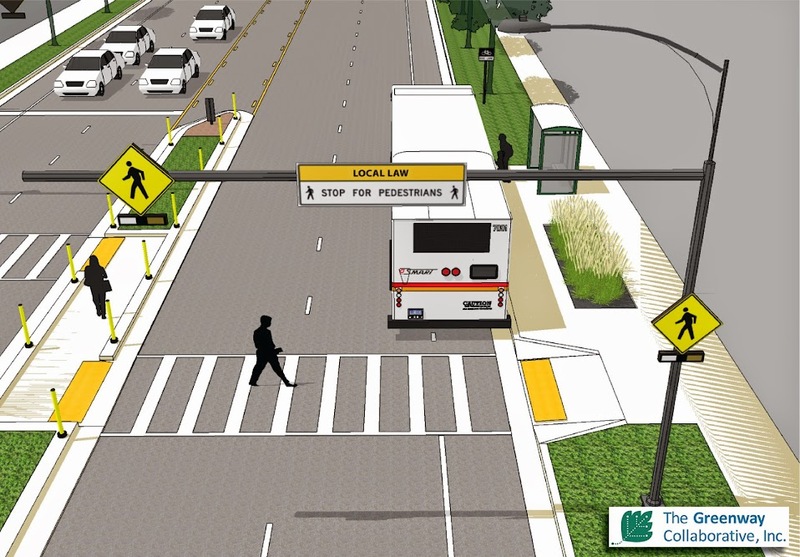 The stop bar (or yield lines) should be placed 20 to 50 feet from the crosswalk to prevent motorists from stopping too close to the crosswalk and blocking the view of the crossing pedestrian for approaching vehicles. The Stop Here to Pedestrian sign (R1-5c) should be used in conjunction with the stop bar. In Michigan, it is a yield or stop based on local law and markings should be adjusted accordingly. If the Yield Here to Pedestrian signs (R1-5b) are used, then yield lines must be used. Based on the speed of the roadway, advanced warning signs should be placed the appropriate distance from the crosswalk to allow for an adequate stopping distance for motorists. A Rectangular Rapid Flash Beacon linked to the beacon at the crosswalk should be used in this location where there are visibility issues. It is important to provide overhead lighting where a pedestrian crosses a roadway to make the pedestrian visible to motorists. Lighting should be placed such that it illuminates the side of the pedestrian facing traffic. Lighting also increases the comfort level for pedestrians at night and in the early morning, especially for school age children. Bus Stops should be positioned on the far side of the crosswalk so that the bus does not obscure a pedestrian crossing in front of the bus. This minimizes motorists mistaking pedestrians waiting for the bus for pedestrians wanting to cross the road. 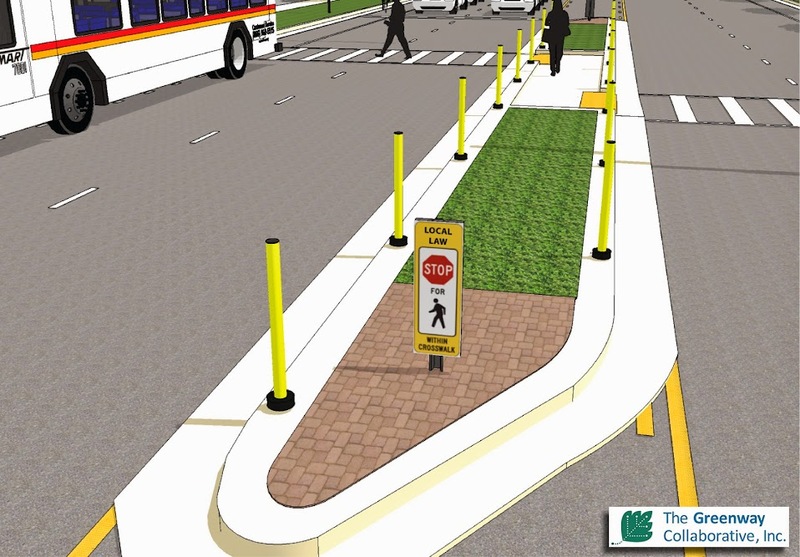 A easy and direct route from the bus stop to the crosswalk should be provided. This is the first of what we hope will be a number of on-line visual guidelines that incorporate current research and national standards to address specific pedestrian and bicycle safety. The graphics may be used or referenced by public and nonprofit agencies with appropriate attribution to The Greenway Collaborative, Inc. 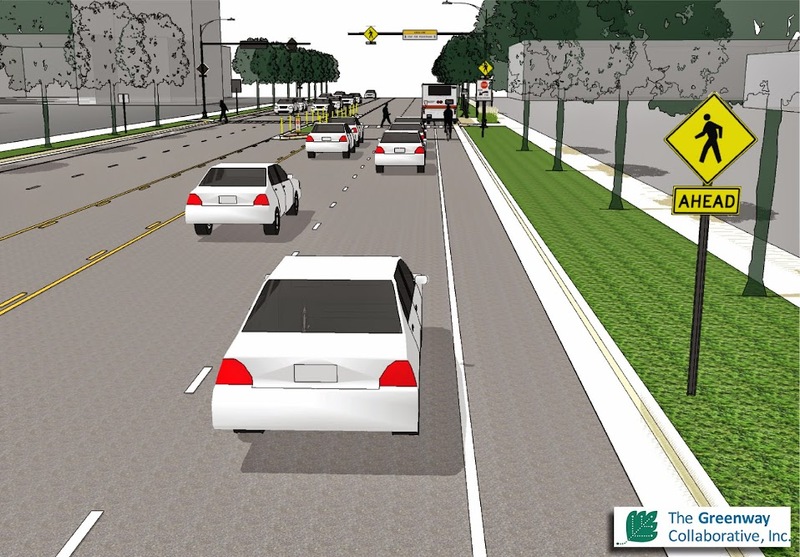 The Greenway Collaborative, Inc. does not accept any liability for designs based on the guidelines provided. The guidelines are provided for general informational purposes only. Each mid-block crosswalk should be evaluated, designed and engineered individually to address the specific context of the situation.